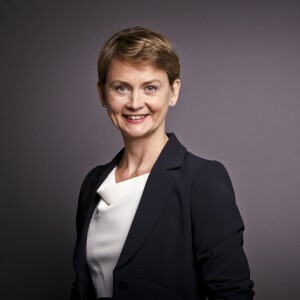 Below is the text of the speech made by Yvette Cooper, the then Secretary of State for Work and Pensions, to the 2009 Labour Party conference. Banks bigger than nations teetering on the edge of collapse. Fearful families moving their savings from bank to bank. The madness of markets in crisis. And we learnt too how much we owe to the strong leadership of our Chancellor and our Prime Minister. And we should start our debate by thanking them now: Alistair Darling and Gordon Brown. Never forget how close we came to catastrophe last year. And never forget how easy it would have been for governments to stand back, to turn their backs, to retrench. That was what governments across the world did in the thirties. And for years working people paid the price. That was what the Tory government did here in the 80s. And for generations entire communities paid the price. And that is what David Cameron and George Osborne wanted us to do again. Conference we know unemployment is never a price worth paying. We will never leave people to stand alone. Our Labour government will never turn its back on those hit by recession or global crisis. We know unemployment hurts. Unemployment scars. That’s why we are putting an extra £5bn into jobs and training. And conference that support and our welfare reforms have made a difference. In just three months this summer more half a million people who were out of work found jobs. But it’s still hard. Now is the time to increase – not cut back – on the programmes that help people get jobs. Programmes like the Local Employment Partnerships between Job Centre plus and businesses that are getting people off benefit and into jobs in every one of our constituencies. Helping people like Anthony in Castleford, who got a job after 14 months on the dole and told me its transformed his life — he’s got his own place, started management training, and been on his first ever holiday abroad. I spoke to Rebecca Robertson, at Job Centre Plus in Castleford who helped Anthony get work about how she does it. She said; “I like to get under the employers skin – know what they really need. Then I can make sure I get people ready for the job.” She gets people training, boosts their confidence, and even goes to the interview with them if they need it – and she takes a spare tie and a spare pair of tights along just in case. Conference, its people like Rebecca, going the extra mile to help people not just get a job but build a future. That’s public service. But we need still to be much more ambitious. There are thousands more people like Anthony. So we will do more. I can announce today that we will expand those successful local partnerships to help far more people. Already they’ve helped over 250,000 people into jobs. Now we will treble our original plans to help a total of over 750,000 people into jobs by the end of next year. Because no one should be denied the dignity of work. Across the country, major employers have been signing up to the Backing Young Britain campaign. From Bradford to Brighton, Coatbridge to Cardiff, councils, housing associations, football clubs and countless community organisations are signing up to our £1bn fund to deliver over 100,000 youth jobs, as we guarantee no young person is stuck on the dole more than 12 months. Even Tory Councils are signing up. Praising the programme and claiming the credit in their local papers. But hang on. Where do they think the money is coming from for those jobs? I’ll tell you where. Its coming from £5bn extra this government has provided to boost the economy. £5bn that George Osborne believes should never be spent. £5bn the Tory party is determined to cut. Conference we need to challenge every Tory MP, every Tory councillor and candidate to tell young people why their party wants to destroy their jobs. Conference the Tory party want to turn their backs on young people again. And we must not let them get away with it. So what would David Cameron put in place of training places and support he would cut? Just one policy. As he told Tory party members in July: “50 of our candidates, MPs and councillors are setting up job clubs.” Instead of 100,000 youth jobs, 50 Tory job clubs. Imagine it. Job clubs run by Tory MPs. David Cameron might have some useful advice on interview techniques. William Hague would certainly be able to help on getting second jobs or making extra cash on the side. John Redwood on how to look interviewers in the eye. Ken Clarke on how to dress for success. You know what Norman Tebbit’s advice would be: take a cycling proficiency course. Conference, may be there’s a reason why David Cameron doesn’t get the importance of training and employment support. For his first job he got a royal equerry to ring up on his behalf. For his second job he got his mother in law Lady Astor to put in a good word. Conference, that’s not how people like Anthony in Castleford get jobs. Back in the real world thousands of people rely on the help from training colleges and Job Centres the Tories want to cut. Conference, the Tories say we can’t afford to invest in the unemployed. I say we can’t afford not to. Look at the facts. For every 100,000 people we get off unemployment we save £700m. There is no better way to cut the deficit once the economy is growing than to get people off benefit and back into work. That is why we will make sure no one is written off. Keeping up the employment support and the welfare reform that is getting people back off long term benefits and into jobs. Helping disabled people overcome discrimination to work. Helping parents get the child care they need. More support and also making sure everyone does their bit. Working with businesses, the voluntary sector in the Flexible New Deal. Not a passive welfare state, but active support for work. David Cameron doesn’t believe in active government to help the unemployed because he doesn’t believe in active government. Their campaigns for Broken Britain, for an age of Austerity, all designed to break people’s faith in a brighter future. He wants us to despair of purpose of politics or the role of government so they can roll back the bounds of government – a counsel of despair that would have run Britain into ground if we had followed it last year. We know things are tougher in recession. But we know if we stand together we can come through it stronger. And we know there will be tough choices on the public finances. But we will make those tough choices guided by our vision of a fairer Britain, for our parents, children, neighbours. That is why we will increase the top rate of tax and we won’t cut inheritance tax for millionaires. It is why we will keep helping families. Backing Sure Start and child benefit. Making sure mums and dads can balance work and family life. Putting into law our commitment to end child poverty for ever. That is why we will keep doing more to help pensioners. Tackling decades of unfairness so millions of women can get full basic state pensions that should be their right. Requiring employers to make pension contributions for the first time for millions of low paid workers. But conference you can’t do any of those things if you don’t believe in the role of government. You can’t do any of those things if you don’t believe in standing together to help build a fairer country. In the thirties one of the first ever women Labour MPs, Ellen Wilkinson, marched with our fore fathers from Jarrow to fight for jobs. In the eighties I marched with my father and with many of you under the Union Banners to fight for Jobs. But Conference. We marched then in vain. Because we didn’t win the arguments. We didn’t win power. And there was nothing more we could do. That’s why we have to fight now. That is why there is so much at stake. That’s why the Labour Party today has more to fight for than ever. We owe it to the young people today, but also to the Jarrow marchers we couldn’t help, to the 80s unemployed we couldn’t support. We owe it to them to fight for every vote, to fight together to win the next election and to build a fairer Britain.